Last year was undoubtedly a positive year for landlords and tenants in the London commercial property market. Towards the end of the year, real estate experts released their forecasts for 2015. The predictions are full of positive and encouraging figures and point at a healthy market where growth is set to dominate. Take a look at some of the most important trends regarding the key growth areas for the commercial property market in London during 2015. According to market analysts at Schroders, during 2015 a number of factors will result in a very attractive property market for landlords and investors interested in London properties. A recovering economy, decreasing unemployment rates, and a limited development pipeline are set to drive demand for existing floor space and to push commercial property values even further. For investors, this means that property yields can reach double digit levels, although all the predictions point at the commercial rental market as the best performing over the next 12 months. According to data from the Investment Property Forum Consensus Forecast, total returns could be as high as 15 per cent during 2015. Rising interest rates are not expected to become a possibility until 2016. There will be few changes affecting office space in the city’s top locations, such as the West End or the City. The most important piece of news for occupiers is that average rents will continue to rise during 2015. On average, rents are expected to rise by 4.3 per cent across city offices. One of the most important areas to watch is the so-called northern City fringe, which comprises neighbourhoods like Shoreditch, Old Street, Farringdon, and Clerkenwell. In these areas, average rents will range between £43 and £55 per square foot. 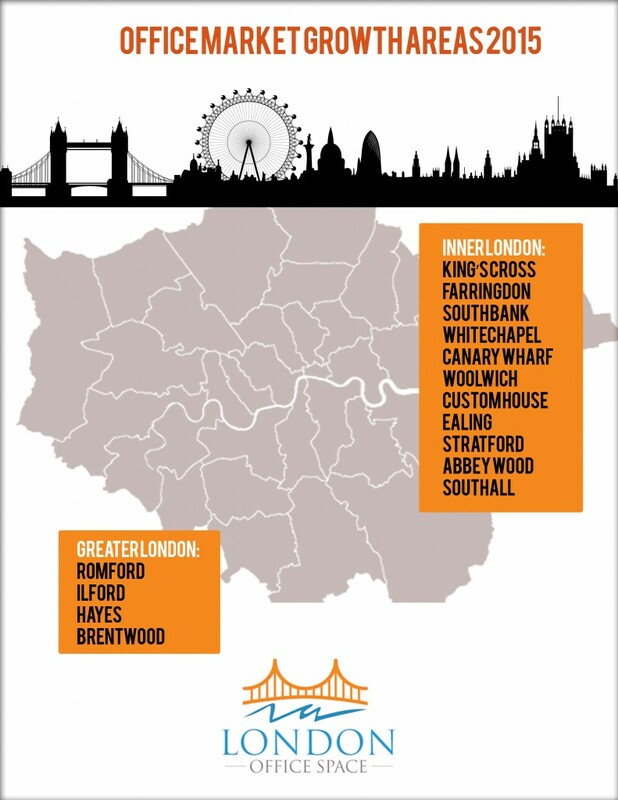 Offices in this part of London are favoured by companies in the TMT sector and by firms that relocate to London from other regional centres. In the South Bank (and especially around London Bridge and Southwark), rents can reach £52 per square foot, as this another area that is expected to grow significantly during 2015.